I’ve previously blogged about running SQL Server in ACS but Microsoft has now released a new version still called Azure Container Services (AKS instead of ACS however) but now specifically tailored to building Kubernetes clusters. There are some differences to the original ACS (making the process simpler) so let’s run through setting up a Kubernetes cluster running SQL Server in AKS. 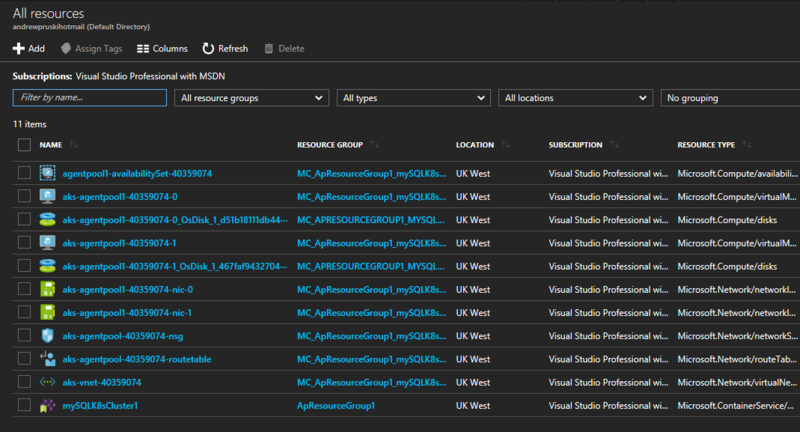 As AKS is still in preview a flag needs to be enabled on your Azure subscription. All that from one line of code! Awesome, I have two nodes up and running in my cluster! Once the service has an external IP, I can use that to connect to SQL Server within my Kubernetes cluster in AKS! This entry was posted in Azure Container Services, Containers, Kubernetes. Bookmark the permalink. ← Blogging for four years! This is really fascinating. I stumbled upon this blog while I was searching for ways to deploy and replicate sql server containers across kubernetes nodes. One thing I’m curious about is would this be useful to solve execution times with long running queries of large databases? Can my application point to the sql server, as a data store, which is deployed in Kubernetes? If this solution can help with running distributed queries, it would be amazing. Thanks for the reply. In fact, I checked out the link you provided before I run into your blog. My question, to elaborate, was if we deploy sql server as kubernetes cluster, would we be able to run queries that will be executed on each worker node? Can we say that it would be count as distributed database? For example if I run a select query on a supposedly large database, would that execution be shared among the worker nodes hence query being distributed would result in faster response? My understanding is that there’s no auto-distribution of queries. The SQL instances in containers managed by Kubernetes behave as normal SQL instances. Kubernetes just manages the containers (nodes) that SQL is running in. So can we say that sql server containers are not scalable in Kubernetes? Because one of the awesome advantages of Kubernetes is its scalability but in the sql server container context then this won’t hold true since it would just be replicas of instances. Is that right? Yes, the advantage of running SQL Server in containers is the ease of deployment. Kubernetes provides high availability but not scalability for SQL instances. Love your article. I have one question about maintenance and upgrades. If I would like to deploy new version of SQL container , how can I stop or remove only SQL server service? Individual components of the setup can be deleted. However if you delete the pod that sql is running in a new one will automatically be spun up. That will drop the pods that sql is running in but keep your resource group and nodes (so that you can redeploy). Just be careful as it won’t drop the service, you’ll have to drop that separately. I’d like to work out how to redeploy a pod to an existing service and will post that in a future blog. Do you know how I can change default IP port for SQL let say to 4433 from 1433? I tried to modify your yaml , but it didn’t work fro me. Thank you. I am relatively new to K8S and wanted to check how SQL Server can be containerized. This clearly shows how to do it on the Azure platform. Good points made on scale vs HA for SQL Server with AKS. So, basically basic SQL Server and not SQL PDW in AKS, right? Also, it is a SQL Server Pod, (running on a linux host ), abstracting the container running SQL Server i.e Not supported on windows hosts yet – correct? Yes, it’s SQL Server and you can provision Windows hosts in a K8s AKS cluster. Just make sure you use the windows sql server image.